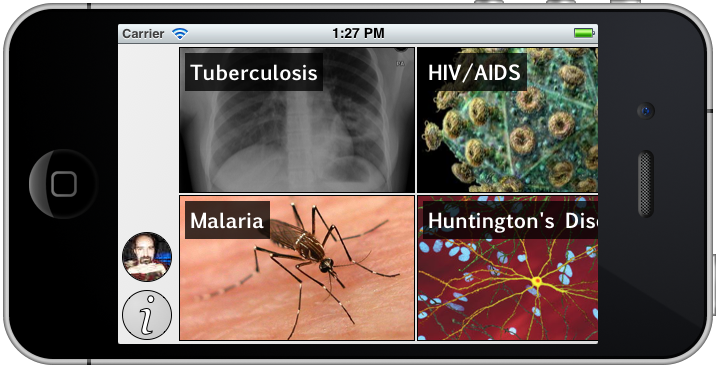 The alpha stage prototype of the Open Drug Discovery Teams (ODDT) app proceeds. Since the last snapshot, a couple of extra buttons have been added to the main page, as can be seen by the graphic on the right (which also demonstrates that this is not just an iPad app, it is designed to work on iPhones/iPods as well). The two new buttons select the user and provide info. The “user” refers to the Twitter account that is currently in use, if any. It starts out as a grey placeholder, until you grant the app permission to access your Twitter account. If you have more than one account configured with the device, you can pick from the list. Once the account access has been confirmed, the app uses the Twitter API to fetch the thumbnail image for the account, and displays it within the button. The ability to switch between multiple Twitter accounts is particularly useful for early stage testing, since I prefer not to overload my primary account, @aclarkxyz, with tweets for endorsing/disapproving of content within ODDT, just to make sure all the behind-the-scenes machinery is working properly. If you were to take a look at the @oddttest user, you would see a lot of tweets with links to http://oddt.net/tweet?&#8230;, which is used mainly as a signal to the ODDT server for formulating its content. At the moment these links go to a placeholder page, but in the near future this will be expanded out to a read-only web based implementation of the app front end. So you when somebody uses the ODDT app to endorse content, you’ll be able to open the link and see what it is that they are voting up or down. The MolSync tweet feature is an effective way to publish chemical structure/reaction/data content. 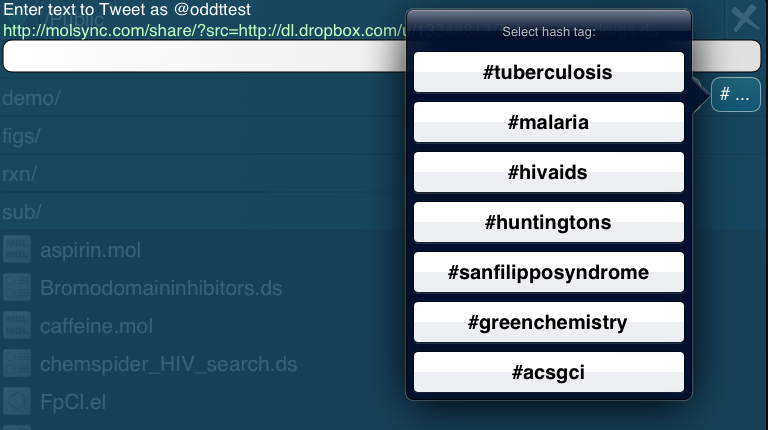 The newly added button, with the label “# …”, contacts the ODDT server and requests a list of all the topic hash tags that are in current use, which is shown above. Selecting one of these will paste it into the tweet, and ensure that the data will subsequently be harvested and included in the ODDT data collection.